No. Key Homes specializes in complete turnkey construction, including but not limited to foundations, septic, driveways, garages, porches, etc. Yes. 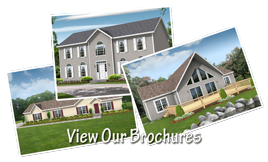 Key Homes has hundreds of floor plans available, however, it is possible to customize standard plans or design your own. When can I paint or wallpaper? Through the first year some settling in your new home will occur, causing a few minor cracks in the sheet rock. This is a common occurrence in all new homes, whether site built or modular and is no cause for concern. As part of the Key Homes warranty our full time service staff will repair any sheet rock cracks through the first year, at which time custom painting or papering can be done. The permits and the fees charged will vary from town to town, however, below is a list of some of the permits you may need. This may not be all of the permits required, but it should give you a head start. Always consult your zoning officer to find out what is required within your town; such as minimum square footage requirements and set backs. 1. Health Permit: If your lot requires a septic system it may be necessary to obtain a permit from the County Health Department. 2. Building Permit: A building permit is required in all towns and must be obtained prior to construction. Some towns may require an engineered site plan in order to obtain your building permit. If this is the case, you will have to hire a NYS licensed engineer to design your site plan. 3. Clearing Permit: Some towns require clearing permits for the removal of any trees. 4. Driveway Permit: It is necessary to obtain a driveway permit from the Sate Highway Department if your driveway is coming off a state road. 5. Water & Sewer Permits: It is necessary to obtain a permit when tapping into municipal water or sewer. Do I have to get my own financing? You are welcome to obtain your own financing, however, Key Homes will help you with the financing process. Key Homes works with a number of financial institutions allowing us to shop for the best rates and programs including conventional, VA, FHA, SONYMA, etc. to suit your individual needs. Most people apply for their mortgage right at our display center. Today’s Modular Homes are models of efficiency and quality assurance. The process of building your new home starts with the design phase. Your new home is drawn up using state of the art computers, which aids the manufacturer in the customizing of your new home and in producing drawings and materials lists. Once designed, the building process begins. This process involves modern factory assembly line techniques. Your home travels from station to station where all of the building trades are represented. Work is never delayed due to weather, sub-contractor no shows, or missing materials. The quality control process assures you that your home has been inspected for code compliance and workmanship. In-plant inspectors as well as independent third party inspection agencies inspect each home to make sure that your new home meets all the state and local codes. What is the difference between modular and doublewide homes? Modular and site-built homes are constructed to meet all state, county, and local building code regulations. Your new modular home is inspected at the assembly plant at each phase of the construction process to assure you that all building code regulations have been met. Doublewide homes referred to as mobile or manufactured homes are constructed to a different type of building standard. This standard, the Federal Construction Safety Standards Act (HUD/Code), unlike conventional building codes requires manufactured homes to be built on a non-removable steel frame. Because of this, and many other construction differences, many town ships have restrictions on where doublewide homes can be placed. Do I need to purchase the property before I buy a home? It is not necessary to own the property first. The property, along with the home can be financed into one package. However, most banks require a minimum down payment of 5%-10% either in the form of cash or equity. How long will my new home take to construct? From the time that your home is ordered, it usually takes 7 to 8 weeks to arrive. From that point, Key Modular Homes will need approximately 8 weeks to finish off the remaining work that needs to be done, (such as the interior/exterior trim and the remaining site work).